(Huntsville, AL) – In celebration of the 2016 #iHeartHsv social media campaign and the Alabama Tourism Department’s Year of Alabama Makers campaign, the Huntsville/Madison County Convention & Visitors Bureau has partnered with Arts Huntsville (formerly The Arts Council) to launch a collection of locally made items that celebrate the Rocket City called the #iHeartHsv Collection. Items in the #iHeartHsv Collection are for sale at the Huntsville/Madison County Visitor Center, located at 500 Church Street in downtown Huntsville. Pricing ranges from $2 to $75, and items include custom mugs, photo prints, tote bags, jewelry, ornaments, decorative platters and much more. In all, over 50 items are available for purchase. Although the #iHeartHsv campaign wraps up on February 14th, the #iHeartHsv Collection will have a much longer lifespan. Items will be available for purchase through December 31, 2016, to celebrate the Alabama Tourism Departments’ Year of Alabama Makers campaign. “The work featured in the #iHeartHsv Collection showcases how local artists love Huntsville, and area visitors have much to discover and love about the hundreds of visual artists working across the Huntsville metro region,” said Allison Dillon-Jauken, Arts Huntsville Executive Director. Arts Huntsville worked with local artists and Arts Huntsville members to compile and curate the #iHeartHsv Collection. For more information on Arts Huntsville or how to become a member, please go to artshuntsville.org. One hundred percent of the proceeds from the #iHeartHsv Collection will go directly to participating artists, making the collection one of many ways to support local arts and artists in the Huntsville and Madison County area. 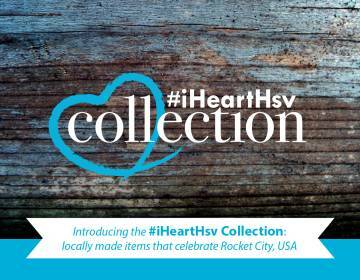 Items in the #iHeartHsv Collection can only be purchased with cash at the Visitor Center. Visitor Information Assistants can connect guests with artist information if they would like to inquire about paying via another method. Our website explaining contest rules, detailing prize listings, etc. For more information, please contact Jessica Carlton, Marketing Manager, at the Huntsville/Madison County CVB at jessica@huntsville.org or by phone at 256.551.2294.